I think a milestone of sorts has been reached. I've seen Nixie clock kits on the Internet before, but last week for the first time I saw one on sale in a brick-and-mortar store, albeit a high-end overly expensive brick-and-mortar store. But at least that means Nixies have finally gone mainstream! If you're wondering why they're called Nixies, the name comes from Numeric Indicator Experimental-1, or NIX-1. Nixie is better at capturing the romance of the thing, however. You could say that Nixies are glass tubes, diodes and neon gas, but I prefer to call them simply "enchanting." Their closest modern cousins are today's LEDs, but where LEDs are harsh, modern and unwavering, Nixies are warm, old-world and inviting. 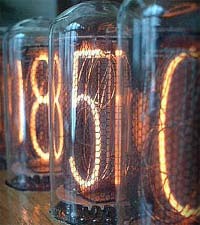 To me an LED is like a fluorescent light, while a Nixie is like firelight. One is efficient, one is artistic. You can get an idea of what they look like from this site, but pictures really don't do them justice. where. do. you. get. them? Finding Nixies is still tough in the real world. 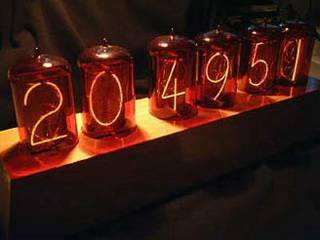 Your best bet is to go to Nixie Clocks first, but be prepared to spend some money. I have yet to see one for less than $300, and that's for a kit. Completed models sell for a lot more, some in the thousands.